February 11, 2013 0 comments on "Conversation Heart Crafts for Kids to Make for Valentine’s Day"
Valentine’s Day crafts are fun for kids to make. There are a number of different crafts that can be made with candy conversation hearts. Here are just a few ideas to get you and your children started. This is a fun craft for older kids. You will need a small round styrofoam wreath, a couple bags of conversation hearts, a hot glue gun, and some ribbon to hang the wreath up. Using the hot glue gun, carefully glue the conversation hearts all around the styrofoam wreath, covering it completely so that no styrofoam shows through. Use additional hearts to fill in any gaps. After the glue is dry, tie a piece of ribbon through the wreath so you can hang it up. There are a couple of ways that you and your children can decorate candle holders with conversation hearts. One easy way is to fill a tall cylindrical vase about half way with conversation hearts and then place a pillar candle inside. You can also use a hot glue gun to glue conversation hearts to the outside of small votive candle holders. For this project you will need an old picture frame. If you are recycling an old frame, you first might want to rub it with sand paper and then spray paint it white or pink. For a shabby chic look, first paint the frame black and then paint the white or pink on top of the black. Using a piece of sand paper, gently rub away some of the top layer of paint to give the frame a weathered look. 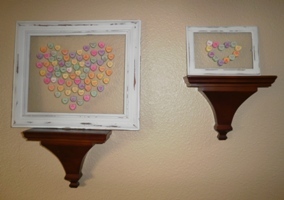 Next carefully remove the glass from the frame and arrange candy hearts on the glass. You can use the hearts to create larger hearts of various shapes and sizes, or you can create one big heart to fill in the whole glass. Just make sure to leave room to put the frame back in place. One by one, remove each conversation heart and glue it back in place with a bit of hot glue. After the picture is complete, place the glass back in the frame and your work of art is ready to display. Use conversation hearts to create a fun bingo game for Valentine’s Day. Have your children create their own bingo cards with the sayings from conversation hearts in each box on the cards. When they are ready to play the game, have them use conversation heart candies to use as markers for the squares. Conversation hearts can also be used to make homemade Valentine’s Day cards. Make a card out of red or pink cardstock or scrapbook paper and glue conversation hearts onto the front of the card. If you feel creative, use the words on the hearts to create sentences on the card. Valentine’s Day wouldn’t be the same without conversation hearts. They are a favorite holiday treat for children and adults alike. Have some fun this Valentine’s Day and share some conversation hearts with your kids while also having fun doing these simple Valentine’s Day crafts.